Tom Cruise has finally started talking about his currently filming role as a German colonel who tried to kill Adolf Hitler. “All I can say is, ‘Save your comments until you’ve seen the movie,'” the 45-year-old Cruise tells the German magazine Bunte. 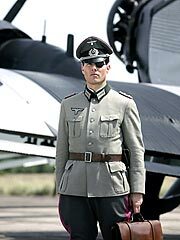 He was responding in particular to the German politicians and media who have pummeled him for his Scientology beliefs and his decision to play Colonel Claus Graf Schenk von Stauffenberg. Cruise also says that when director Bryan Singer approached him about playing the Colonel that he, Cruise, “intuitively…saw a similarity in the profile of this man with myself.” If Cruise were a Method actor, he might have gone all the way and converted to Roman Catholicism, which was the religion of Colonel von Stauffenberg and, previously, of Cruise’s wife, actress Katie Holmes. The whole thing looks and sounds like some gay uniform fetish film, especially with Bryan Singer as director…hmmmm!